The typical big event in short track racing has become a worldly affair. Area motels can be overbooked, track parking lots can be loaded with RVs and the cost for a team to merely show up can be through the roof. Big purses need to be fed too, so fans pay up for tickets. There’s usually plenty of pomp and circumstance, but all of that comes with a price. 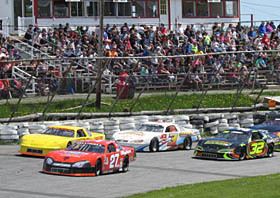 That was not the case on Sunday afternoon for the Coastal 200 at Wiscasset Speedway (ME). This was a race that was for the locals – both the teams and the fans. The license plates in the parking lot were mostly from Maine and only one driver, Wayne Helliwell, Jr., hailed from out of a state. Helliwell and his team crossed the border from neighboring New Hampshire for the event. Not a single team in attendance towed to the track with a big hauler. There wasn’t a single semi-truck, toterhome or stacker on the property. Located in the self-promoted “Prettiest Village of Maine” – Wiscasset – the track hosted their biggest race of the year in somewhat understated fashion. It was a big deal, but not an event that had more hype than substance. Fans only paid $5 to get into the grandstands, crew members paid $20 for pit entry, concession prices were not raised through the roof and the lock-buck teams were not just welcome, but encouraged, to attend. A mix of invaders also were attracted to the Coastal 200 including Helliwell, Dave Farrington, Jr. and Travis Stearns. In the end, it was someone very familiar with the track who ended up in victory lane. Josh St. Clair has competed at other tracks in Maine – most notably Unity Raceway and Speedway 95 – but he got his career started at Wiscasset and scored the biggest victory of his career there on Sunday. St. Clair did not spend much time out front. With six laps to go, he was still fighting for a mere podium finish, but the race took on a whole new complexion on lap 194 when runaway leader Travis Stearns saw a very unwelcome caution flag wave due to an incident involved Steve Reno. That set into action a chain of events that left Stearns and Helliwell fuming while allowing St. Clair to win. Good fortune for St. Clair meant bad fortune for Stearns and Helliwell. On the first attempt at a restart, Stearns took off in the low groove while Jeff Burgess lit up his tires, spun around and headed off turn one backwards. The second attempt at a restart saw early leader Helliwell cycle back to the front. Helliwell was marching back through the field after brake problems and was especially good on short runs. When the green flag waved again with just six laps to go, the fireworks were lit. Helliwell ran to the outside with a slightly quicker car while Stearns drove his heart out down in the bottom groove. A few times contact was made. Once, Stearns got sideways in turn one and two but never backed out of the gas. Helliwell started to inch ahead just a little bit on the outside, but both drivers soon found out with just two laps to go through that two cars cannot occupy the same place. Contact was made coming out of turn four and both Stearns and Helliwell went spinning down the frontstretch. There were differing views on what caused the incident. Nick Jenkins finished second, taking home the ARbodies Most Improved Award based on his start of 18th. Andrew McLaughlin, Will Collins and Dave St. Clair rounded out the top five finishers. The “other” St. Clair might have been the happiest person at the track after the race. The 66-year-old is the grandfather to race winner Josh and a former owner of the track. He used the backstretch to cut smoky doughnuts after the finish and had a very interesting strategy as he did not change tires throughout the 200 lap race. Helliwell and Stearns ended up being credited with the 11th and 12th finishing positions. Richard and Vanessa Jordan currently own and operate Wiscasset Raceway. They had been best known in racing circles for being the longtime sponsor of Kelly Moore’s entries in what is now the NASCAR K&N Pro Series East. For the late 1980’s and through the 1990’s, a Jordan Lumber-sponsored #47 was a common sight in victory lanes of many NASCAR Touring events. The Jordans entered a whole new realm of the sport though when they attended a real estate auction back in 2012. That was when the Wiscasset track was up for sale. With its future uncertain, many racing supporters attended merely out of curiosity. The Jordans were one of those parties and had no intention of becoming track owners. But when the bidding stayed low and the track's future grew more doubtful, they stepped up and bought the facility for a mere $130,000. Weekly racing returned to Wiscasset with the emphasis being put on everyone having fun. Admission prices were kept low, competitor input was sought in making the rules and most of all respect became a two way street. A four-post lift was even installed in the pit area to allow teams to be working on their racecars even easier at the track. A throwback sight of the Coastal 200 was the #1 racecar of Adam Chadbourne. The car was a stock-bodied Camaro that normally races in the Super Street division. Chadbourne sported a somewhat stock mid 1990’s steel body on his car and although he was at a disadvantage, he still survived the race and finished in the 16th position. Kurt Busch was not the only driver doing double duty on Memorial Day Weekend. Dave Farrington, Jr. ran two races in two days – both in the State of Maine. 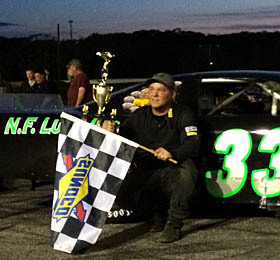 Farrington, a part-timer on both the ACT Late Model and PASS Super Late Model tours, ran the Pro Series race at Beech Ridge Motor Speedway on Saturday night. He finished second to race winner Corey Bubar. On Sunday, Farrington ended up with a sixth place finish in the Coastal 200. He led laps in both events. Farrington and his car owner father have been up for all types of racing adventures in the past season. 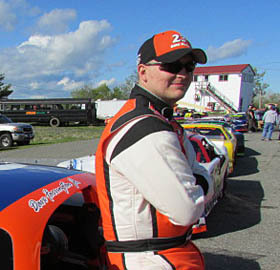 He’s run weekly races throughout New England, venturing as far south at Waterford Speedbowl, while also running selected ACT and PASS events. He told Speed51.com on Sunday that he is considering a run for the points championship at Beech Ridge this year based on his runner up result on opening night. Travis Stearns had not been planning to come to the Coastal 200, but a last minute decision changed that. Stearns’ #16 team decided on Friday to attend the Wiscasset race. 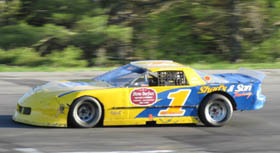 They considered entering the Memorial Day Classic at Vermont’s Thunder Road Speedbowl, but opted to take the shorter trip to the track in their home state. The team’s goal for the weekend was to try and turn around a frustrating season. Working on the pit crew for runner-up Nick Jenkins was 2012 PASS North Super Late Model champion Travis Benjamin. Also spotted in the pit area at Wiscasset was track legend and former PASS North race winner Scott Chubbuck who ran the Pro Series race the night before at Beech Ridge Motor Speedway (ME) in his own #15 car. OFFICIAL FINISH 2014 COASTAL 200. Josh St. Clair takes the Costal 200. A strong crowd and a strong field at Wiscasset. Dave Farrington, Jr had a busy weekend.